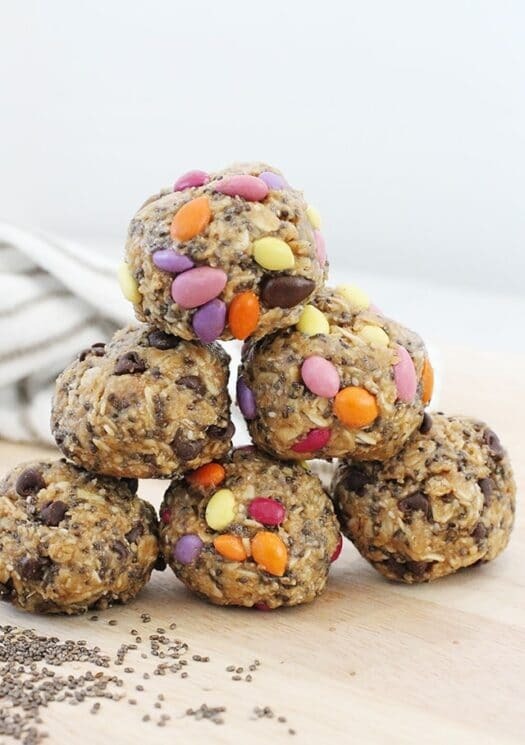 Avoid getting HANGRY with our super delicious Chia Seed Energy Bites. 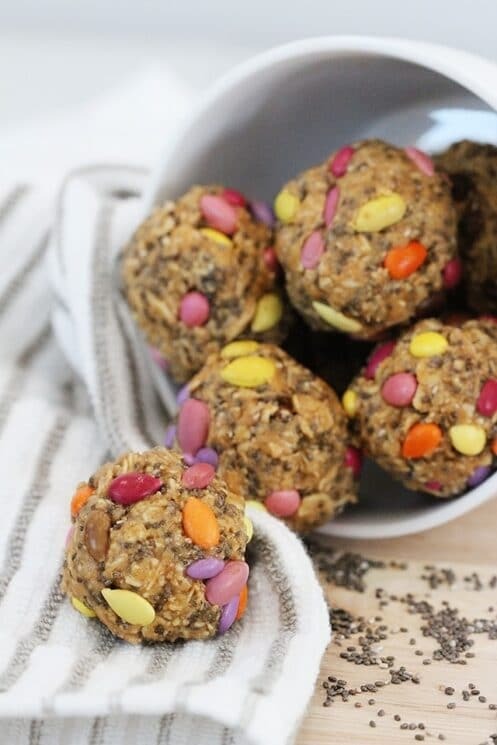 These little bites of goodness are just the ticket for a quick and healthy snack. 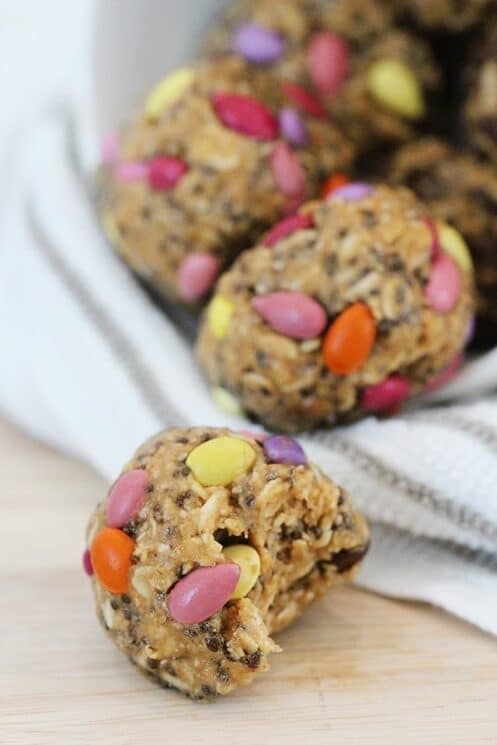 Energy Bites are a no-bake healthy snack that take just a few minutes to make and are filled with protein, fiber and healthy fats to keep your kids fueled until their next meal. So what is in an energy bite that makes them so amazing? The combination of oats, nut butter, and chia seeds create a mixture that is a powerhouse of nutrients. And the most important factor here is that they taste sooo good. When you can make healthy food taste good, it is a win/win for you and your kids. We added these beautiful chocolate covered sunflower seeds for kid appeal – what do you think? Also, if your kids are allergic to peanuts, or your school is nut-free, you can substitute sunbutter! 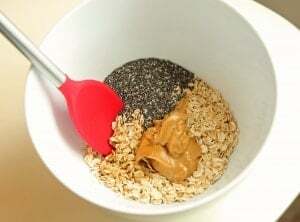 Mix your basic ingredients in a bowl: Oats, honey, peanut butter, vanilla, and chia seeds. If you are going to use different add-ins, separate the mixture into different bowls. Refrigerate for about 20 minutes. Flatten on parchment paper and then cut into ‘bites’. 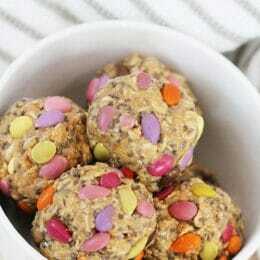 Or if you want to skip this step, you can just roll the mixture into balls. You can refrigerate these and they will stay good for at least a week. If you are wanting to use them for hiking, running, biking, or other endurance activities – I would put a few in a small portable container in the fridge for a quick grab-n-go. Chia seeds have gotten quite the hype the last few years. In the running and endurance athletics community they have definitely become a hot commodity since their introduction in the book ‘Born to Run’ by Christopher McDougall. In the book, the super-athletic Tarahumara Indians in Mexico consumed chia seeds while on their desert runs and were provided with surges of energy during and after. So are chia seeds really the next promised super food? I’ve been curious to know exactly why they are claimed to be so good for us and so I did a lot of reading about them and this is what I found out. 1 tablespoon of chia seeds contains 5 grams of fiber, 3 grams of protein, 2282 mg of Omega 3 and 752 mg of Omega 6 fatty acids (This makes them a really great source of both fiber and Omegas). A significant concentration of fiber combined with their ability to absorb 10 times their weight in water also makes chia seeds excellent for maintaining regularity and also contributing to satiety. Contain iron, calcium, magnesium and zinc. Emerging research suggests that including chia seeds as part of a healthy diet may help improve cardiovascular risk factors such as lowering cholesterol, triglycerides and blood pressure. And last but not least, our Energy Bites!! 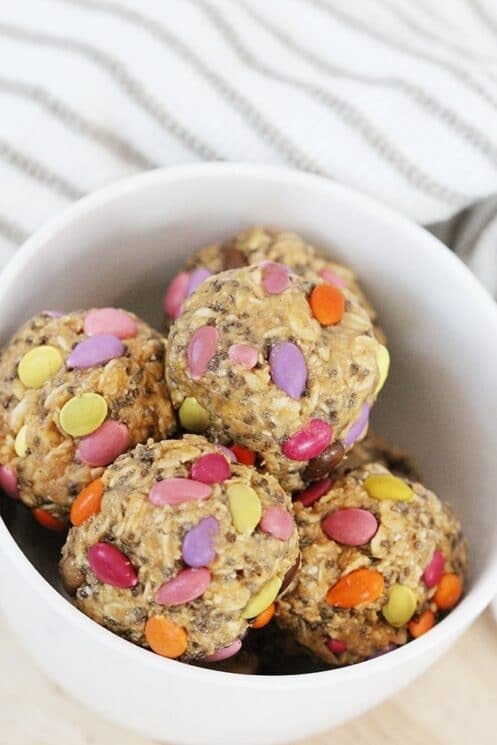 These literally will take you 5 minutes to whip up and they are really delicious. The fun part for your kids is that they can choose their own add-ins. The sky is the limit and if they get to choose something that goes in them, they will be more likely to eat them, guaranteed. For the chocolate covered sunflower seeds, get them on Amazon here! Combine ingredients together until well mixed. Where is the best place to buy the seeds? Where can you find/buy them? We love chia seeds! 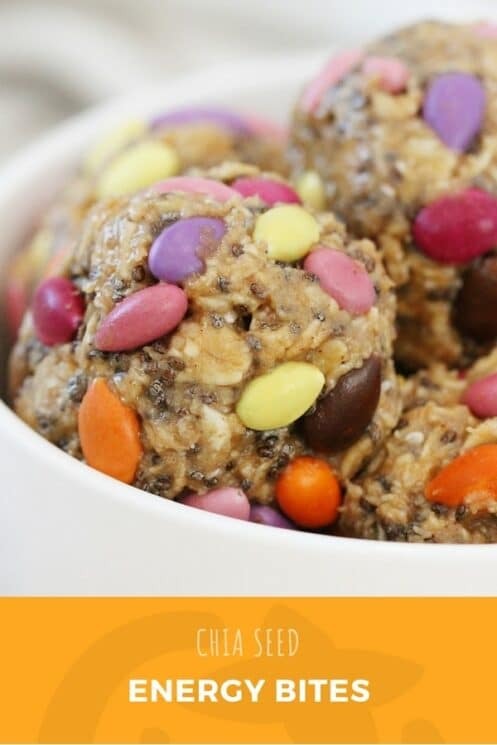 I think I’ll go make these for my boys’ afternoon snack. Thanks! I have seen them at Whole Foods, Trader Joes, and at other smaller health food stores. I have also seen them at Walgreen’s believe it or not, and you can always purchase online. http://www.thechiaseed.com sells them in bigger bags and they have free shipping. They sell a big bag of chia seeds at Costco too! Sprouts also has them too. If you have never had them before a good idea is to go to Whole Foods or Sprouts and buy a little bit in the bulk bins. Nope – you definitely don’t have to soak them. They will just have a little crunch to them without soaking. You could definitely use almond butter. I find that almond butter has a little more mild taste that peanut butter, but it would still be delicious! Oh yes – I forgot about Costco! Thanks for the tips. I can’t wait to make these! We’ve been using chia seeds for a while and my kids love them! Do you know how much children should have per day? I have a 5 year old and a 7 year old, and I’ve just been sprinkling some on top of their oatmeal, smoothies, ect, because I searched the Internet but never found out a safe amount for kids. I don’t think there is a recommended amount of chia seeds for children from any credible source. I have read that a recommended amount for adults is 1 Tbsp per day, but I’m not sure of the source on that. My personal recommendation would be to continue what you are doing – sounds like a reasonable amount to me! These look very easy to make and would be so delicious too. I’ve been seeing chia seeds next to the quinoa at the grocery store lately and was wondering what made them good for you. Thanks for the nutritional info! I’ve also heard a lot of good things about these chia seeds. 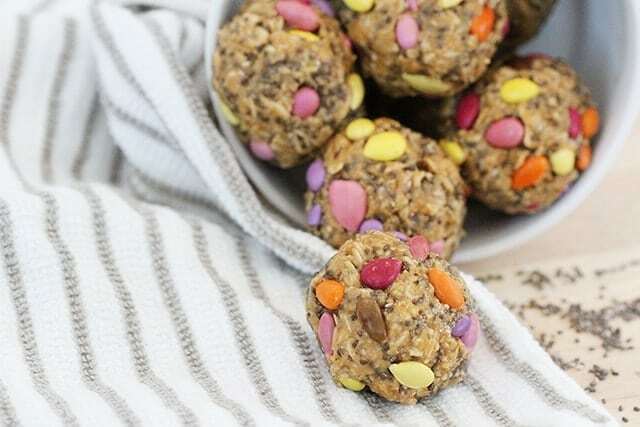 I’m always looking for recipes and healthy snacks for me and my kids and these look absolutely perfect. So I will definitely give these a go. Costco has very recently started to sell Chia seeds. The cost is at a fraction of any other source I have found so get them while the getting is good. I made these a few days ago and they are delicious!! I had a hard time keeping them together, though. I made balls and, although they generally kept their shape, they are really soft. Still incredibly delicious! I’m definitely taking these on our next run/hike. Thanks! Right after I first made them they had a harder time sticking together, but after I refrigerated them for a bit they definitely held their shape and were more ‘solidified’. Try refrigerating for longer!?! I’ll give it a shot – they’re so delicious! Thanks so much! Thanks for this quick and easy recipe. What else can you use apart from honey? I have a honey allergy and would still like to make these. Also, what’s your opinion on brushing these with some flour water before popping them in the refrigerator to help keep their shape? I’ve made these without honey before. After I add the peanut butter and oats, I stick it in the microwave for a few seconds. The softened peanut butter helps bind them together as well. You might have to add a little extra peanut butter though. You could try brown rice syrup in place of honey. I’m not sure if the flour water would go over well – it might change the look of it and possibly taste? But brown rice syrup tends to be a little more sticky than honey so that might help in keeping their shape. Good luck! Costco sell Chia Seeds!! Cheapest place I’ve found them. I have learn many things from your blog about Chia Seeds. Thank you very much to share it. You could use any alternative nut butter: almond, cashew etc. Also you could try sunbutter. I love this! I’ve been wondering what to do with my chia seeds from t joes and I knows two year old will love these. My only questions is what do you mean by “if you are doing different add ins put in diff bowls. Each ingredient refrigerate in sep bowls? If you look at the picture above, I separated each mixture that contains a different add-in just to keep them separate. I mixed in the add-ins (dried blueberries, coconut flakes, etc) after the ‘batter’ was made in separate bowls and then formed the ‘bites’. Hope that helps! Just looking for the Nutritional Facts for these bites. Mainly calories. Made them today with dried blueberries and they are delish, my toddler also loved them, Thanks! Healwithfood.com has a wonderful nutritional profile on chia seeds. They contain healthy Omega 3 oil, lots of fiber, antioxidants, as well as calcium, potassium, and some of the B vitamins. What type of oats do you use? Instant? Steel cut? Etc. excited to make these! I used Old fashioned oats for this recipe. Turned out great! We don’t have the nutrition facts for this recipe. It would change depending on what you add and how much. I am amazed at the diversity of the chia seed. Those energy bites look like such a wonderful treat for the kiddos. I love when you can combine good health with tasty snakes. Thanks for the ideas, I’m going to try the coconut bites! Thanks for the post! I didn’t realize Chia seeds had so much omega 3s in them. I will recommend them to my patients! As I’ve lived in Scotland before I’m going to try these with some porridge! = mega healthy breakfast woohoo! I just bought some chia seeds and am excited to try this recipe. My daughter is allergic to PB though so we’ll substitute with sunbutter. Thanks! Love your healthy snack ideas for kids, which by the way, the “kid” in all of us will also enjoy! The only comment I have regarding something I would change is the suggestion of adding M&Ms to the mix. I would avoid regular M&Ms due to the artificial colors, hydrogenated fats, etc. which are harmful ingredients, especially for kids. I would buy a healthy version of “M&Ms” which would contain natural coloring from fruits and veggies, like purple cabbage, beets, blueberries, etc. They can be found in bulk at a health food store like Whole Foods. I also found a brand at Target called UNREAL CANDY UNJUNKED, with NO chemicals, hydrogenated fats, preservatives, corn syrup, artificial colors/flavors or GMOs and they are just as good tasting as regular M&Ms, my grandkids can’t tell the difference. I’m a Certified Holistic Health Coach, so I too am always looking for healthy alternatives to feed my own family as well as share with others. Love your website, keep up the great work! Not dumb! lol. Yes it is vanilla extract. Thank you for the suggestion! That is a great alternative. What would be a good substitution for the oats? I love your site. I know lots of recipes you share are for kids but they are helping me a great deal for myself just trying to find healthy little snacks to have during my transitioning period into an alkaline way of eating. Thanks for all you share! I was wondering if there would be a substitute for honey? I am trying to really cut down on my sugar intake, and even though it is a natural raw sugar I still don’t want to have that much sugar. TIA! Hi these sound great but is there a substitute for the peanut butter my 3 yr old son is allergic thanks! Hi! I love all your recipes. My son has Asperger’s and some food/texture issues. The veggie fruit muffin was my favorite because it’s hard if not impossible to get him to eat fruit because of the wet texture. And he prefers raw veggies over cooked ones. But he loves muffins! His favorite are fresh green beans from the garden. Anyways, can’t wait to try this recipe! Looks like a great portable snack to take to the pool. Anyway you can begin to add calorie counts to the recipes? I try to follow low calorie diet and keep track of my calories. 🙂 Thanks! Sunbutter is the brand name and it’s made from sunflower seeds. I think it’s pretty good and our daughter really likes it. Are there any substitutes for the honey? Made these today and they are delicious, but want to try different variations. Thanks! You really can use any sweetener you like. Agave or brown rice syrup would also work well. Have you tried sunbutter? That is our favorite substitution! Have you tried soy butter (made from soy nuts) or pumpkin butter (made from pumpkin seeds)?? Hi I’m curious to know what the appropriate serving ssize is. One or two balls? Or more? The ones that I made are really small. The serving size would depend on the person. For a 2 year old, 1 ball would be an appropriate serving size. For an older child or adult, I would say 3 would be a good serving size. I am wondering if you have any suggestions for replacing the oats. I am allergic to oats. But I love the other ingredients. I have an oats allergy, too. Did you ever receive any response on a substitution? You could try using sunbutter. Is it ok to just use the oats raw or do you have to soak them first? Yes I just put them in raw. Is there any substitutions for oats? I’m allergic. You can try. ground flax, rice bran, and quinoa flakes. Do you cook the oats first? I’m confused…. I love using organic chia seeds in our diet. The health benefits are amazing and we simply add them to our smoothies in the morning. 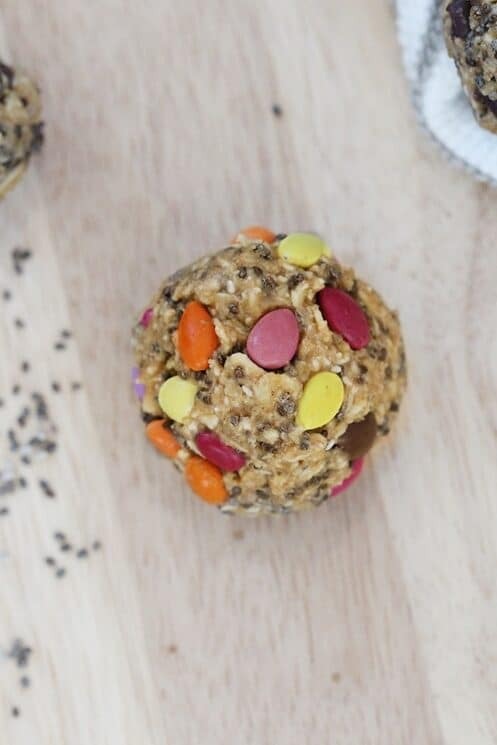 The energy bites recipe you posted looks delicious and I know my son would love these. I guess I will be making a bunch of these now. These are delicious!!! What a great jumping off point for a healthy snack. I added 1 tbsp on Enjoy Life chocolate chips and 1 tbsp of milled flax seed. My kids will be thrilled when they get home today and see their new snack. Will these still work without peanut butter?